Night sweats that interrupt your sleep can be debilitating and also a little worrying if you’re not sure what’s causing them. In this article, we’ll look at the common and not so common reasons for night sweats; how they often relate to hormone imbalances and what you can do to prevent them from happening. Are Hot Flushes & Night Sweats Making You Miserable? 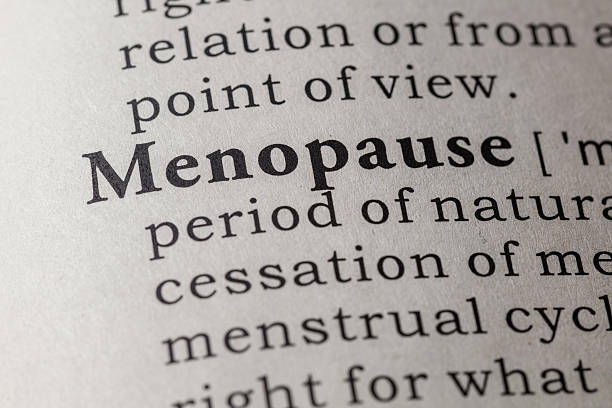 Vasomotor symptoms such as flushing and night sweats are the most commonly reported symptom of the menopause occurring in up to 80% of women. Symptoms generally last for 1-2 years in most women but can continue for as long as 10 years or more in others. The years between 40 and 50 are a time when it is common for women to experience hormonal changes. This is because the body gradually uses up its pool of ovarian follicles, which are needed to produce eggs. The eggs are no longer maturing and thus ovulation ceases. At this point, the ovaries stop producing oestrogen and progesterone affecting the delicate balance of female hormones. And so, begins the fluctuations that bring on symptoms such as hormone imbalance sweating. If your sleep is regularly interrupted by surges of intense internal heat accompanied by night sweats, you might wonder what specific female hormone causes it. The reality is that many hormones are involved - it takes a complex dance of hormones working in unison to maintain a stable environment in the body. It’s only when this is thrown out of kilter that episodes of temperature discomfort accompanied by profuse sweating occur. Once the ovaries become redundant, changes in the levels of oestrogen and progesterone disturb information being relayed to and from the pituitary gland, which causes levels of GnRH (gonadotropin-releasing hormone), FSH (follicle stimulating hormone) and LH (luteinizing hormone) to rise. A combination of surges in GnRH coupled with changes in levels of progesterone and oestrogen are thought to be the cause of menopausal symptoms in many women. Hot flushes and night sweats are a form of temperature dysfunction and are triggered by small elevations in the body’s core temperature which it works hard to normalise. It does this by increasing sweating and rapidly dilating your peripheral blood vessels - to bring heat to the surface of the skin. This rapid and exaggerated response is thought to be due in part to depleted oestrogen levels around the menopause. 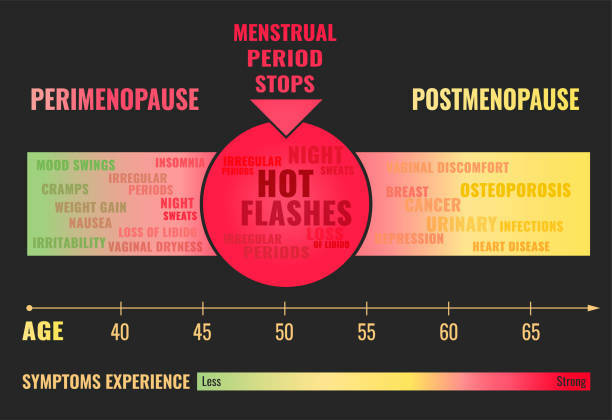 However, oestrogen reduction alone cannot completely explain the occurrence of hot flushes, as all women go through the menopause but not all experience hot flushes. As well as these levels of oestrogen are typically low in pre-pubescent girls and yet they do not experience hot flushes and night sweats either. It has been suggested that symptoms are more likely due to decreasing levels of oestrogen rather than low levels. The withdrawal of something the body has become used to can trigger hot flushes and sweating. The ratio of progesterone to oestrogen may also be a factor. Oral doses of progesterone have been found to significantly improve hot flushes. A team of researchers from the University of Arizona, College of Medicine have identified a mechanism that might be partly responsible for hot flushes. The team have discovered a group of brain cells known as KNDy neurons located in the hypothalamus that may have control over hot flushes. 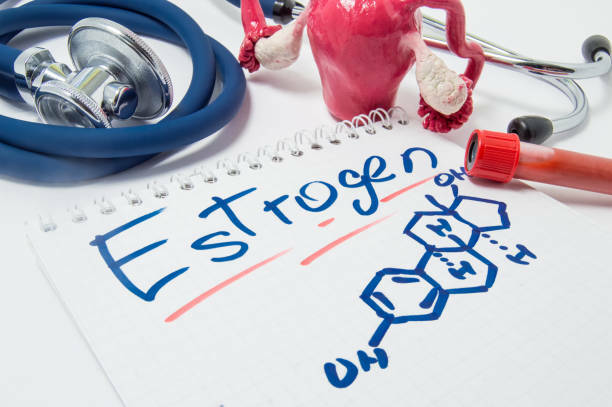 These neurons respond to circulating oestrogens and appear to go haywire when levels are low, producing significantly more neurotransmitters than they would if oestrogen was present. Because the neurons communicate with temperature regulating centres in the brain it is thought that the increased signalling activity makes the body believe it is too hot. This triggers heat loss mechanisms like dilation of blood vessels in the skin and profuse sweating. Keeping body temperature regulated is essential for humans and particularly important for pregnant women who need to avoid extreme hyperthermia. Whilst KNDy neurons have the ability to influence thermoregulatory centres, they are not solely responsible for managing body temperature. Some women also experience hormonal night sweats before a period, although this is more likely to occur in women who are in the early stages of the perimenopause. For most women hot flushes begin during the perimenopause - unfortunately the earlier the perimenopause the longer the hot flushes last. According to research if you are inactive, stressed, overweight, or a smoker you are likely to experience more frequent and severe hot flushes. Currently, the most effective medical treatment for hot flushes and night sweats is oestrogen therapy which has been found to virtually eliminate the symptoms. However, many women are unwilling to take this type of therapy due to concerns about the elevated risk of breast cancer. When it comes to balancing hormones and preventing night sweats, a healthy diet coupled with a few lifestyle changes can have a really positive effect. Plant-based foods naturally contain phytoestrogens. These gently mimic natural oestrogens and can help to support normal oestrogen levels in the body. A diet rich in phytoestrogens can help to reduce typical menopausal symptoms like hot flushes and night sweats. Plant lignans are the main source of phytoestrogens in a typical Western diet. As well as phytoestrogens, certain vegetables contain other chemical substances that could also help with hormone balance. All the more reason to pile your plate high with a colourful selection. INDOLE-3-CARBINOLES - these compounds are specific to the cruciferous family of vegetables. They help to transform dangerous oestrogen into a more harmless form. Studies have also found that they stop the growth of breast cancer by inhibiting the action of a specific enzyme. Cruciferous vegetables include cabbage, broccoli, Brussel sprouts and cauliflower. APIGENIN - this plant chemical is thought to inhibit an enzyme call aromatase, which converts androgens to oestrogens. It can be found in celery, bell peppers, chamomile, peppermint and parsley. Low blood sugar can trigger night sweats. Maintaining balanced blood sugar levels throughout the day can help to prevent this. This simply means eating low-glycaemic-index foods that release their sugar more slowly into your bloodstream. Avoid sugary highly processed foods such as biscuits, chocolate, white flour products, white rice, sweets and fruit juice and replace them with whole grains, beans, lentils, nuts, seeds, non-starchy veggies, and fruit. Add a little protein or healthy fat with each meal too as this delays the emptying of the stomach helping to control blood sugar levels. Stress and anxiety can promote hot flushes and night sweats. Listening to meditation recordings before sleeping can aid relaxation and help to prevent night time sweating. Yoga and meditation are also great tools for reducing blood pressure and managing stress. Some promising research has suggested that regular yoga sessions can help to alleviate night sweats. RHODIOLA - This herb has been shown to help the body adapt to stress, which may reduce the frequency and severity of night sweats. ASHWAGANDHA - Is another herb that helps to manage adrenal function. Substances called withanolides within Ashwagandha have been reported to relieve stress. BLACK COHOSH - This traditional herbal remedy is commonly used for the relief of menopausal symptoms. It is thought to exert oestrogen like effects and studies have found it to be particularly useful for hot flushes and night sweats. WILD YAM – Is a North African plant containing compounds called steroidal saponins. These chemical substances bind to oestrogen receptors in the body similarly to phytoestrogens, helping to maintain the balance of progesterone and oestrogen. 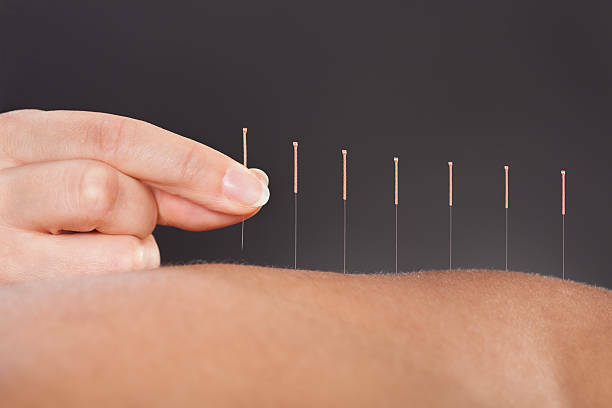 Acupuncture is a popular and safe treatment for a range of conditions and now preliminary evidence suggests that acupuncture may also be effective for vasomotor symptoms. A small study involving patients receiving anti-oestrogen therapy for breast cancer found that acupuncture provided effective relief from hot flashes and the effects lasted for at least a month after the treatment ended. Research shows that deep breathing can significantly reduce the number and intensity of hot flushes. Sit in a quiet room in comfortable clothing if possible. Inhale slowly and deeply through your nose for five seconds, then exhale slowly for 5 seconds. Focus on the air going in and out. When your mind wanders and distracting thoughts arise, let them pass and return your focus to your breath. Repeat for 15 minutes in the morning and 15 minutes in the afternoon. Smoking can increase your likelihood of experiencing menopausal symptoms such as night sweats. Chemicals in cigarette smoke raise your heart rate, blood pressure and body temperature, which activate your sweat glands. If you don’t want to aggravate hot flushes and night sweats, then avoiding alcohol and spicy foods is a good idea. Both are stimulants that cause blood vessels near the skin to dilate inducing sweating. Whilst night sweats are most commonly experienced by women during the menopause transition there are sometimes other causes. If you have night sweats that regularly disturb your sleep you should see your GP. There are a range of diseases that can cause hot flushes and sweating. Fever is probably one of the most common causes. Coughing combined with night sweats are just two of the symptoms associated with tuberculosis (TB) one of the diseases mentioned above. TB is a bacterial infection caused by a germ called Mycobacterium tuberculosis. It is spread through the air from other people and can affect any part of the body, although it commonly affects the lungs. People with weakened immune systems are at higher risk of developing active TB. It can sometimes start out as a harmless cough but if not treated it can be fatal. In England in 2017 there were around 5,000 cases of TB. If you are experiencing any of the above symptoms you should see your doctor who can put your mind at rest. It is easy to let your imagination run riot in the dead of the night especially if you are experiencing regular night sweats. There are some cancers such as lymphoma and leukaemia where sweating is a dominant symptom but it is not the only symptom, so your GP would be looking for other symptoms before suggesting further evaluations. The thing to remember is that night sweats are fairly common - particularly around the menopause or due to fevers. If you are worried though, you should see your GP. If you are feeling anxious or stressed it can cause you to experience night sweats. The way that your body responds to stress can cause specific physiological changes such as increased heart rate, quickened breathing and perspiration. This stress response enables you to deal with a threat by either fighting or running. Worrying at night can trigger these responses and could be the reason for night sweats. If night sweats are keeping you up at night a consultation with one of our Amchara health practitioners could help to identify the root of your problem and guide you towards improved restorative sleep through individualised diet and lifestyle changes.